It’s all getting very real. I’ve been doing the kinds of things I probably should have done with my books published by big publishers. But who really knew then? 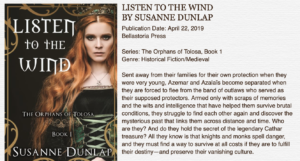 For instance, I’ll have a blog tour for Listen to the Wind in May. Because that’s what’s hardest for an author with a book brought out by a small publisher: getting it into readers’ minds, hearts, and hands. A blog tour is perfect for writers like me—with day jobs! The reality of life for most writers is that writing does not pay the bills. Even those who get decent publishing contracts or are well-known don’t always earn enough to make ends meet. Some of my favorite authors (including Sigrid Nunez, who just won the National Book Award with The Friend) have to teach as well as write. But along with writing while having a day job comes time limitations. There is so much work to do for publicity, and how do you get those important reviews? Enter the wonderful, soulful, book-loving Amy Philips Bruno, who has carved out a business managing blog tours for historical novelists. Her extensive contacts would take years for an author to develop, and her joy in getting authors out there is palpable. What happens on a blog tour exactly? The answer: different things, depending on the blog. Some just write reviews, some send interview questions, some ask for a guest post. The idea is to do it all in a concentrated period of time, like a physical book tour. Sure, it would be awesome to have the backing of a publicist arranging everything and sending you all over the country to read and sign books, but that only happens for the big books. There’s room for all kinds, though, and a blog tour is an efficient, economical alternative. So check out the tour schedule at Historical Fiction Virtual Book Tours! I hope you’ll join me on this adventure. I’ve loved every part of this process so far. Working with Bellastoria Press has been fabulous too. I’ll be sharing more news about the launch as it happens, so stay tuned! Previous: So, how’s it going with the publishing?